By the early 21st century, Caperitif had become a ghost ingredient in classic cocktail recipes. What was this mysterious ‘Cape Aperitif’ that was referenced in that classic cocktail bible from the late 1800’s, the Savoy Cocktail Book? This question asked by an adventurous Danish mixologist lead to a meeting with a maverick South African winemaker and the rebirth of South Africa’s once-famous vermouth. 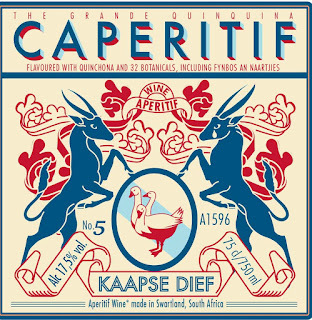 Caperitif is handcrafted by infusing Chenin Blanc with the flavours and aromas of some 35 natural botanicals, many of which are unique to the insane biodiversity of the Cape Floral Kingdom. Caperitif is made from wine fortified by spirits, gently sweetened with the sugars of the grape, bittered by cinchona bark and flavoured with a selection of some 35 natural botanicals, including Fynbos, Kalmoes and Naartjie.